Few weeks back, I participated in this contest, organized by Nutriplus. I know I sound bad, but of course it's always the prize that entices us to join any competition right? To me, it's more for the fun of competition, the ability to push myself to do better, to challenge myself. I love the finals, it will be a black box challenge and we have to bake something on site without getting any hints earlier.. That will be ultimate challenge for me, Love it! 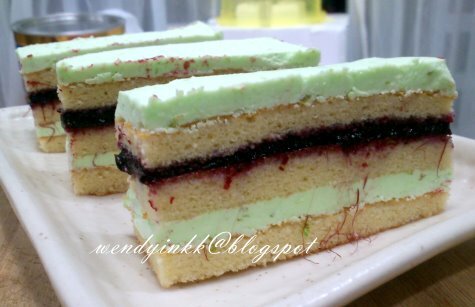 For the semi finals, selecting a submission entry is not difficult because I loads of bakes in my blog. In the end I decided to submit Montebello. A visually enticing cake that is not too time consuming to make (if I don't have to peel the pistachios). I was told by the organizer that he will try to get skinless pistachios for me. So, this cake is fine to go ahead with. Then later.... we were notified the black box challenge for FINALS will be scraped and we will be notified of the major ingredients soon. Ahhhh!!!! I felt so doused! Rain came falling on me... totally drenched! The email came and we were notified that the final bake has to consist of Nutriplus jumbo eggs and Tropical fruits! Aiyoyo! The current months are soooooo bad for tropical fruits. There aren't much to choose from as it's not season for a lot of fruits. Mango is not in season. 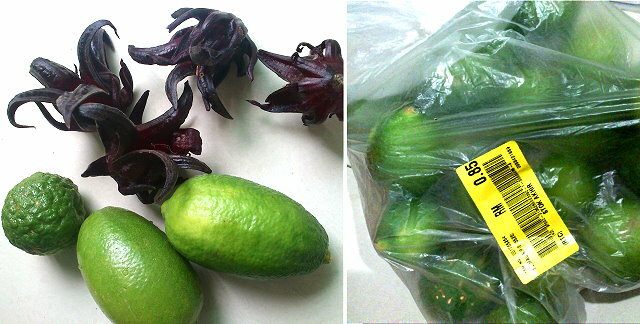 Rambutans, mangosteen, starfruit, even if in season I won't know what to do with them. Guava papaya is not easy to work with. Pineapple could the choice for other contestants. Melons are only used raw.... so what else can I choose? No no no, durian, cempedak or jackfruit is no no no...too strong smell. In the end, I settled for local citrus. Available all year around and easily purchased anywhere. Green lime, calamansi and pomelo. Maybe throw in some roselle too. Roselle is not a flower, it's a fruit. some of the drafts I 'drew'..
Lime roselle with coconut joconde. Roselle Kaffir compote! Delish when freshly made, yucks after I kept it jarred for 1 week! The taste of the kaffir turned to the taste of dried tangerine peel that we use to boil herbal soups. Even my kids said yucks to the roselle kaffir compote. Lime and coconut Mousse with coconut joconde. I didn't have time to get fresh coconut milk, so I used packaged milk. Indeed it did, but.......... It wasn't as nice as I hoped. I don't like the taste of the packaged coconut milk in the mousse. I added kaffir lime zest to the mousse and then green lime juice... the effect was... dish wash lime mousse! But the texture and taste was good. For once, I do not want to smell my cake, at least pretend not to smell it. Now I understand why no one bakes with kaffir lime fruit, no one likes eating dish wash. LOL. 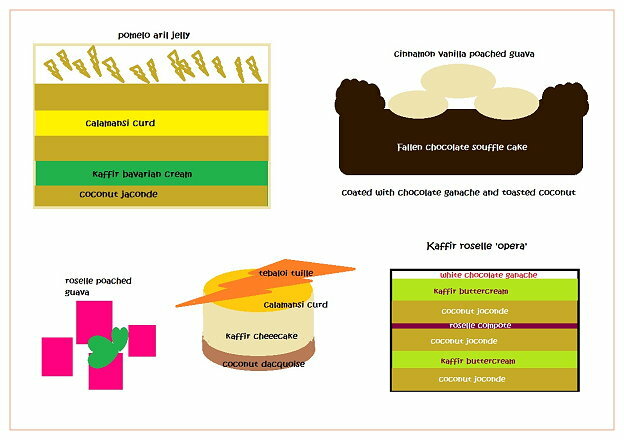 I thought I'll just stay safe with banana and chocolate, and be fancy with some piped sponge. Garnish with chocolate sauce and then some honeycomb candy. DIY ones that bubbles and burns! It's quite a show to make, hehehe. The Bananas were sauteed with butter and brown sugar, flambed with Rum and lightened with a bit of lime juice, then filled into coffee dipped sponge, with cream cheese frosting piped on. I tried chocolate sponge and regular sponge. Choc looked better and could hide the coffee well, and the regular one is stained with coffee. It was quite ok to many, but I felt sooooo 'jelak' (cloyed). The combination is not well liked by me, but the sponge biscuit was absolutely delish! Trial Run 3------ KIV, not sure. At this point...... I am stressed. Tomorrow I will be travelling to KL for the competition already. I don't have the time to try anymore. It's not that I wanted to win the competition. I wanted to win myself. How come I've been making 3 trial runs and all didn't win my heart. That's what happened during Masterchef Blogger, the dish didn't win my heart, so in the end, I wasn't even glad I won it. I want to make a cake I am happy with. At least a cake I would enjoy eating. Doesn't matter if it doesn't win the competition, but it must win my heart. I'm not thinking that I'm going to enter finals 100%, but wouldn't it be wasted if I never prepared when I was actually notified of it way before hand. There's no room to cry if I really get into the finals and have nothing in hand. I went through the judging scheme and soon came to realise, I need not focus too much on creativity or doing something new. As long I do my technique right, the taste is delish and balanced, that's all that matters. I shouldn't focus 50% of my energy to do things that doesn't matter to judging. I tried to be someone I was not, I'm no french baker, I'm a home baker that bakes like Rose Levy Berenbaum. I'm no Sadaharu Aoki or Pierre Herme. So, in the end, I decided to do something I am absolutely comfortable in doing and I am sure will enjoy eating. I decided to do a charlotte with lime mousse, since the sponge biscuit I made for the Banamisu was very very good, the lime mousse in trial 2 was also good. Charlottes always scores extra visual points, hehehe. I have never seen a charlotte blog entry not looking nice. But those are mostly made with store bought Saviordi biscuits. I am going to make my own. That is my plan to gain some mastery points. And somehow I worry the judges will feel "urrgh" after eating so much butter and sugar all 4 days..so I must make something refreshing. But my lime charlotte looked quite bare...I need something more.. but can't figure out yet. I was packing for my trip to KL for the competition, then my mom and I went out for lunch. Yeah, she came by for a short visit. 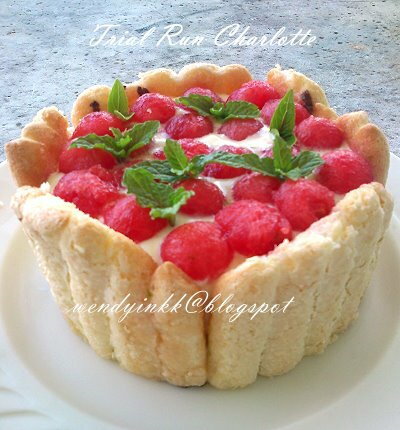 I saw watermelon sold at the rice shop and it came to me immediately that I should top my lime charlotte with watermelon. Lime and melons are good friends. I bought a small pack of cut watermelon for 70 sen and quickly sprang into action when I arrived home. 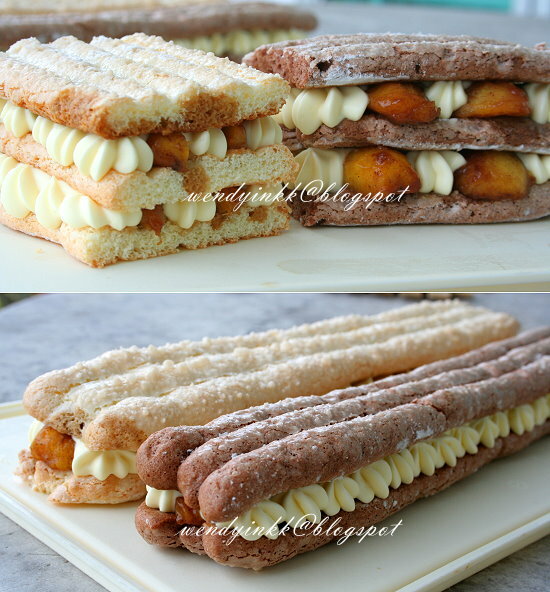 I used scraps from the the BanaMisu experiment and quickly tried to compose a charlotte just to test the flavours. I then plucked some basil and mint from the garden and tested a glaze for it. Everything was perfect! I have found my cake! Since I'm quite used to simply concoct things for cakes (as long I have the idea), I didn't fix a recipe for the competing finals cake. As usual, the idea is in my head, I'll just play along by taste testing along the way to find the right amount of juice, right amount of sugar, hehehehe. But of course, I do have basic ratio rules well embedded in me. I finished packing and we left home to KL. The stone was lifted from my heart. Your determination and perseverance already won you a few points, Wendy. Wish you all the best tomorrow. Break a leg! you made a right choice, Charlottes always look great and beautiful, great idea to replace the normal strawberry with local fruit watermelon! Wah! I didn't start preparing for final until after the semi final! Lol. Never thought that I'd go through. You are so dedicated and professional! I just don't want to regret it, if I really get into finals with no cake in hand although the theme is already given few weeks in advance. 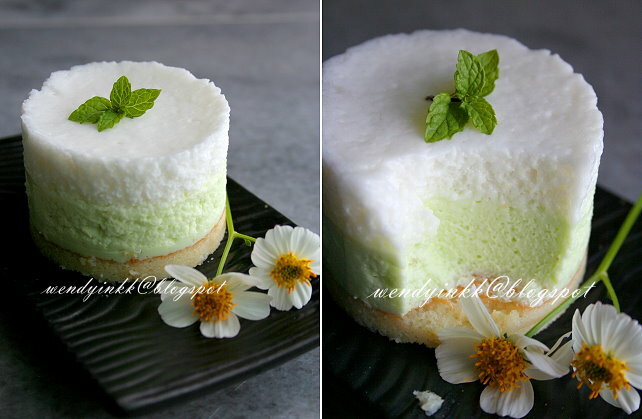 the lime and coconut mousse in trial 2 looks quite nice..taste like dishwasher?? hehe..remember you said that you were having problem with your nose..luckily you got your smell sense back to normal that time..
Hi Wendy, you are so awesome. Agreed Charlottes is always very presentable! !